In planning to build outdoor waterfalls, you need to concentrate on two structures: the pool into which the water falls and the cascading structure for the waterfall itself. The latter is often the more difficult to build, but in this article, I show you how to build it in a way that is not only simple but cheap. It involves using rock, which many homeowners have right in their own backyard (or can find readily elsewhere). Once these two structures are in place, you'll use a pump in the pond to keep water recirculating from the pond to the top of your waterfall, whence it can plunge back down to the pond. Outdoor waterfalls come in all shapes and sizes and make for emphatic focal points. When mulling over your design options, the main consideration is how to achieve the necessary height for the waterfall. Often, a landscape designer exploits a slope on the property, or else (if the whole property is level ground) erects a berm (i.e., an artificial slope) to create such an area behind the pond. Either way, it means a lot of work. And it won't be cheap, either. When building such large outdoor waterfalls, you must lay down a flexible liner on the ground between the top of the waterfall and the pond, to channel the water. Boulders are then placed on the liner to hide it and hold it down. Unless you're building an outdoor waterfall of large dimensions, such work and expense are unnecessary. Indeed, many homeowners who are landscaping in small spaces would prefer a smaller waterfall, as long as it brings the wonderfully soothing sound that results from water striking water. One alternative is to use pre-cast concrete forms that mimic stone for the cascading structure. They're compact and easy to install, as they're simply stacked up over the edge of the pond. But they cost money. If you have access to natural rocks, why not take advantage of a free resource? That's the route I take in this outdoor waterfall project. Another alternative, by the way -- if all you care about is having cascading water (as opposed to a genuine waterfall) -- is to make a cascading clay pot fountain. Supplies Needed to Build Outdoor Waterfalls -- The Cheap Way! Tubing to run from pump to top of the waterfall. Large plastic flower pot (or similar) to house tubing. You should be able to buy the pump, tubing and rigid pond liner that you'll need to build backyard waterfalls at major hardware chains. The use of the flower pot will be explained later in the article. See if you can find 25-30 rocks. A mixture of sizes and shapes is fine but include at least a few large, flat rocks. This is a dry wall project, so it is certainly to your advantage to have flatter rocks, where there's a choice: they're easier to stabilize. I collected several additional smaller stones to place around the edge of my pond (to hide the plastic edge) as decorative elements. The pump I used is a "Little Giant" submersible pump, with a 6' cord. It's a 120 GPH pump, which means it displaces 120 gallons of water per hour -- sufficient for such a small garden pond. The width of the tubing that fits this particular pump is 1/2 inch. I used a small, cheap rigid plastic pond liner (also called a "preformed" liner) that is 2' in diameter and 7" deep. You'll use the sand to supply "adjustable flooring" for your rigid plastic pond liner. Along with a carpenter's level, this will come in handy when you attempt to get your pond liner to sit level in its hole. But before doing any digging for outdoor waterfalls, have a certified electrician install a GFCI (ground fault circuit interrupter) outlet near where the pond and waterfall will be if you don't already have one. Since the cord length of the pump I selected was 6', I determined a location for mine that would be within 6' of the outlet. An ideal location in your landscaping for a waterfall is near a patio, where you can enjoy its soothing sounds. There's another matter to attend to even before contacting an electrician. You should call the Dig Safe phone number to make sure your digging for an outdoor waterfall and pond won't damage any buried utility lines. Before you begin, pull any weeds from the spot you have chosen for the waterfall pond. Afterward, level the area. Now you're ready to excavate the hole, into which your liner will be inserted. There is an easy way to guide your shovel as you dig: turn the liner over on the ground, upside-down, where you want the pond to be, and trace out your circle. Incidentally, I suggest taking care of the waterfall pond structure first, simply because you'll be laying your rocks for the cascading waterfall structure in such a way that the front of it overhangs the waterfall pond. This entails placing some of the bottom rocks very close to the waterfall pond. If you were to build the cascading waterfall structure first and then dig the waterfall pond, you might undermine those rocks. Besides, the overhang of the waterfall structure will just be in your way while digging. The depth and diameter of your waterfall pond's hole should roughly match the corresponding dimensions for your preformed liner. But if the hole ends up being too big, you can correct your mistake afterward by applying sand. Indeed, plan on shoveling sand into the bottom of the hole, as sand gives you a base that is malleable (allowing you to play with the height of the preformed liner). Apply approximately one inch of sand at the bottom, so that the rim of the liner stands an inch or so above the ground. This slight elevation will minimize the problem of soil spilling into the waterfall pond. Put the preformed liner into the hole for the waterfall pond. Determine whether it's even by placing a carpenter's level on top of it (front to back, as well as left to right). Not even enough to suit you? Then extract the liner and scrape the sand at the bottom this way and that to even the liner until you're satisfied it is level. For pictures that correspond with these instructions for installing preformed liners, please see my article on building water fountains. Before moving on to the waterfall structure itself, a word of caution is in order. I will be discussing strategies for minimizing water loss. But regardless of how well you do at minimizing water loss, it is prudent to check the level of your waterfall pond water periodically. Should the pond go dry due to water loss, you'll burn out the pump. Consequently, you must turn off the pump overnight or when leaving your property. Of course, if you're frugal, you'll unplug the pump when you're not around anyhow, to save money on electricity. Since this water feature is intended only for decoration and for relaxation (it's not a fish pool), there's no reason to keep it running if you're not there to enjoy it. With the pond complete, that means one of our two structures is out of the way. Now it's time to turn our attention to a more exciting structure: the cascade design itself. And that means taking another look at the rocks we'll be using. The most important rocks are what might be termed the "spillway" rocks. By "spillway" I mean the rocks directly over which the water will cascade. In my sample cascade design, I use two such rocks, one above the other. This gives my cascade design two levels (separate waterfalls, if you will), for greater visual impact. The spillway rocks should be relatively flat (as opposed to rocks that are more rounded in shape). They should also have sharp, squarish edges. Water will cascade more cleanly over such edges. When rocks have blunt, gently curving edges, some of the water tends to follow that curve and trickle back under the rocks. Not only is the cascading effect in the latter case less spectacular, but you'll also lose a lot of your water (because it won't fall cleanly into the pond). In sum, the idea behind the selection of spillway rocks for a cascade design is to choose rocks that are most likely to channel the falling water in the precise direction in which you want it to go. How you lay the spillway rocks is also important to this end, as we'll see later. In addition to seeking out relatively flat rocks with sharp edges, see if you can't find rocks that are slightly cupped. That is, occasionally you'll come across rocks that curl up ever so slightly at the edges, leaving a depression in the middle. The natural channel in such rocks will be greatly advantageous for the creation of the spillways in your cascade design. Their raised edges will help keep the water from deviating where you don't want it (namely, behind the rocks). You may have been intrigued by one of the supplies I listed earlier:: "Large plastic flower pot." Here's what that's all about. I used an empty flower pot, 11" high, that had a 1/2"-diameter drainage hole in the bottom (to match the diameter of my tubing). The pot simply functions as the housing for the tubing (within the cascading structure for the waterfall). You could easily substitute something else that might work better; I selected a plastic flower pot simply because this is an item gardeners' always have in abundance (and are dying to find a use for!). For instance, a terra cotta pot would be even better, since it provides more stability. A crate made of rigid plastic would also work. The idea is to have some sort of housing to hold the tubing in place, while you lay up the rocks all around it. This housing won't show when you're finished: it will lie hidden at the center of your rock work. You'll essentially be building four mini-rock walls around the pot, to box it in. Make a small trench for the tubing to sit in under the rocks, so that the rocks don't weigh it down. This will keep the tubing free, so that you can slide it through the pot up or down, at will. This gives you the leeway that you need since you won't know exactly what height you'll want the water spouting out until you've finished laying the rocks. After laying my first course of rocks in the front, I covered them with a sheet of black plastic, 4' long x 3' wide. I extended one end of the plastic up to the top of the plastic pot while tucking the other over the lip of the preformed pond liner and down into the water. I then disguised this plastic with rocks, so that it wouldn't be visible in the pond (the end of the plastic near the pot will be hidden by rocks later, as I build up the wall). Using this cheap plastic (I simply sliced up a trash bag) is a frugal substitute for the more expensive flexible pond liner that one would use for a larger cascade design (and that you could use in this project, too, if it fits into your budget). The plastic serves the same purpose: namely, to catch more water than the rocks alone could and funnel it into the pond. Much of the water that would otherwise be lost to splashing strikes against this plastic and falls back into the pond, instead. Also after laying the first course of rocks in front (and just after laying the black plastic), I laid one long, flat rock spanning them all and sitting right on top of that plastic. In the waterfall photo showing the cascade design in progress, the black plastic, and the spillway rocks are absent in order to give you a clearer shot of this rock and of the first course of rocks upon which it sits. My long, flat rock juts out in the direction of the pond, forming an overhang. It will serve as a shelf for my first spillway rock, so I'll refer to it subsequently as my "shelf rock." If you wish to reproduce this cascade design, seek out a long, flat rock of ample mass for such a shelf rock. Invert the flower pot and thread your tubing through the hole in its bottom. Place the pot on the ground (still inverted) at the center of what will be the rock waterfall structure. How far in the back of the pond should this be? Well, that depends on the depth of your rocks. You'll want the rocks that face the pond to abut it; if possible, they should even overhang the pond slightly. So if the rocks you'll be using there are 8" in depth (i.e., front to back), the front side of the pot should be about 8" back from the edge of the pond. How long should the tubing be? Where on the ground should it rest? Well, as far as length goes, I would advise against trying to get a perfect measurement right away and then cutting. Instead, leave yourself with a length that is longer than what you'll need, and trim later as necessary. This will make your job a lot easier! As to where to run it along the ground, choose either the left or the right side of the pond and rock waterfall. As a cosmetic touch at the end of the project, you can go back and hide it with stones and/or mulch. Typically, when building rock walls, it's a good idea to stagger the seams. Of course, these will be very small rock walls, so it's not a structural concern here. Still, try to do some staggering, if only because it looks better. As already mentioned in speaking of rock selection, after my first course of rocks in the front, I laid 1 long flat rock spanning them all. Because this rock's function is to form an overhang, it's a key piece in your cascade design. Using it as a shelf, you'll place your first spillway rock (see below) on it, in such a way that the spillway rock overhangs the pond even further. Continue laying the 4 walls, until you've reached the height you desire. Once you're done encasing the pot with the 4 walls, you need to place 2 longer stones across the top (either front-to-back or left-to-right) to span the walls. Pull up the tubing to gain more length, if necessary, and gently sandwich the tubing in between these 2 longer rocks to hold it in place. Begin trying to position your first spillway rock on top of your shelf rock. It should jut out over the pond even further than does the shelf rock (ideally, the tip would line up over the middle of the pond, although this is difficult to achieve). Elevate the first spillway rock in the back, to achieve better water run-off. You can elevate this or any rock in the wall by using shims (small flat stones). Bend the end of the tubing down towards the pond and place one or more capstones over it. It is under here that the waterfall's "spout" will rest, so to speak. By "capstone" I mean a stone that will partially hide the tubing and/or gently press it down against the second spillway rock (as yet uninstalled). Make sure most of the capstone's weight rests on the rocks between which the tubing is sandwiched (or on shims) so that the tubing doesn't become flattened. You'll have to play with the level of the spout, as you begin to fit in the second spillway rock. Begin trying to position your second spillway rock on top of your first spillway rock. Again, elevate the rock in the back using a shim, to achieve a steeper pitch. One way to think of the placement of the 2 spillway rocks is that they're like 2 shingles on a roof. They're both on a slant, and the top one overlaps the bottom one, forming a continuous chute down which the water can pour. The position of the end of the tubing that forms the spout can now be determined more precisely, as you size it up on the surface of the second spillway rock. Again, pull to lengthen or shorten your tubing, as necessary. 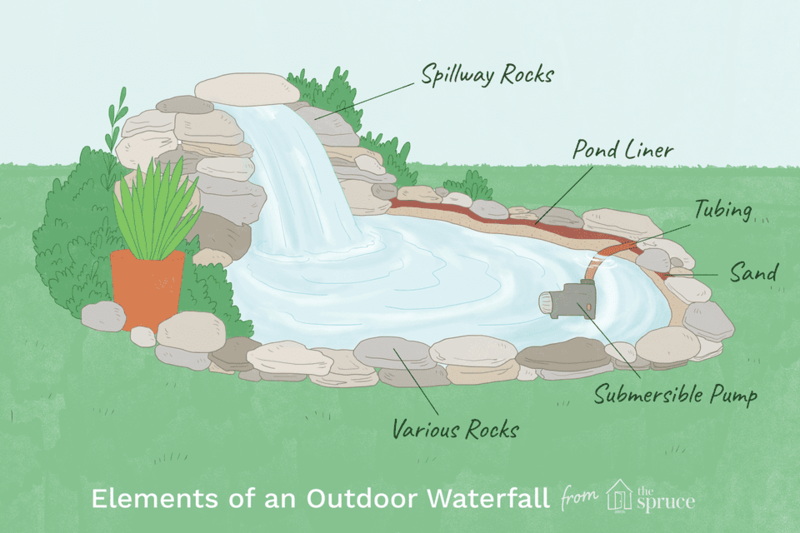 You're ready to fill the pond with water, plug in the pump's cord, and test the flow of your natural rock waterfall. No doubt, you'll have to make several adjustments before you get everything right. The objective is to get the water to fall as close as possible to the middle of the pond so that you can minimize water loss from the splashing that will incur. Note, however, that there's some compromise involved with your cascade design: greater height equals greater visual impact, but greater height also equals greater water loss (as the splashes will be more violent). Another consideration on height: keep your natural rock waterfall in proportion with the pond. A general rule of thumb would be, the smaller the pond, the shorter the rock waterfall. When undertaking projects such as building natural rock waterfalls, always keep home safety tips in mind. Another project in which you may be interested is building a small pond and using water-garden plants in and around it.